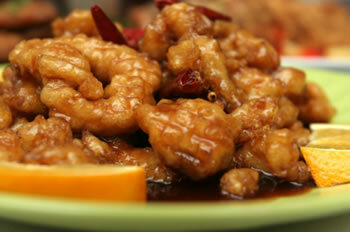 This Chinese orange chicken recipe is a nice simple starter to those of you who are new to cooking chiniese food. It doesn't require any exotic or difficult ingredients and is pretty hard to get wrong. Chop the chicken into small, one inch chunks. Mix the white wine and th cornflour together, whisk thoroughly. Add teh chicken to this mixture and set aside to marinade. Mix the seseme oil with the orange juice, chilli powder, soy sauce and sugar. Tis makes the orange sauce. Mix well. Dog out your wok and add some vegetable oil and stir fry the garlic for aout 15 seconds and then remove the chicken from it's marinade and add to the wok. Stir fry untill the chicken turns white and then pour in your orange sauce. Stir fry untill it get nice and hot. Serve with rice, noodles or a nice fresh salad.